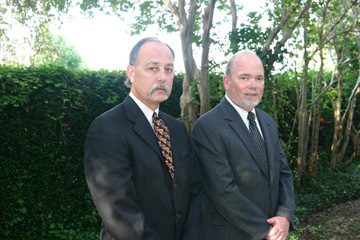 Pete Hinojosa and Bobby Cook accuse the district clerk of political vengeance. Critics say Wilder�s using county jobs to punish foes and reward friends. Friends and enemies continually circle the political planet of Tom Wilder, a Republican mainstay who recently won his fourth term as Tarrant County district clerk. Supporters say he efficiently manages business operations in county courts and keeps a watchful eye on taxpayer dollars. Foes say he is mean, vindictive, and slicker than a greased ice cube, which is why he thinks he can kick to the curb several longtime county employees who dared to buck him, while creating a high-paying job for a political friend, all without suffering any voter backlash. Some folks in county circles compare him not so lovingly to �Mr. Haney,� the scheming opportunist of Green Acres. Yet criticisms seldom stick, whether he is limiting access to public records, protecting his turf by fighting local judges� attempt to hire a court administrator, or eschewing a pre-trial release program created to get low-flight-risk defendants out of jail quickly and reduce jail overcrowding. The reporter called Wilder, who, as anyone who knows him can attest, is rarely short of words. Williams won the election, created chaos, served eight years before self-destructing, and is now a punch line. Wilder kept chugging along, never losing credibility despite the occasional bump in the road. His most recent brouhaha registers as a small blip on Wilder�s worry scale. Wilder�s image as the Teflon Man hasn�t stopped co-workers from butting heads with him, accusing him of retaliation, political back-scratching, paranoia, and megalomania. Or, to put it simply: �Tom Wilder is not a nice person,� said Pete Hinojosa, who will be out of a job if Wilder has his way. After working for years as a manager under Wilder, Hinojosa ran against him in the recent election. And lost. Afterward, Wilder announced an office reorganization plan that would eliminate four jobs � a vacant position and three manager positions. Wilder said the office is top- heavy with managers and needs to be streamlined, and it is just coincidence that the three managers who would lose their jobs are political adversaries. He estimates his reorganization would save $100,000 a year if the changes are approved by county commissioners. One of Hinojosa�s supporters during the campaign was accounting manager Bobby Cook, whose job would be another of those eliminated. He�s not buying Wilder�s explanations. A third man slated to lose his job is records manager Cruz Hernandez, who crossed Wilder by refusing to help in the district clerk�s most recent campaign, although he did in years past. Wilder�s reorganization plan also calls for the creation of several new jobs, including that of a chief deputy clerk position that would cost the county more than $100,000 a year. His foes say the position was designed for Parker County Judge Debra Dupont, a political ally who recently lost her bid for re-election. Dupont worked closely with Wilder and his staff during the 1990s while she was an assistant Tarrant County district attorney. Dupont did not return calls for comment. During an interview for this story, Wilder referred to the position as a �general counsel,� someone with a master of law degree who could provide legal advice. The district attorney�s office routinely provides legal help to the district clerk. Wilder�s critics say an in-house general counsel position is unnecessary and wasteful. Later, Wilder downplayed the term �general counsel� and described the new position as a �consigliore� � a term more often used to describe a mafia don�s top counsel. �I�m still planning on the DA representing me in court, but we have a daily need of readily available legal advice,� he said. Wilder wasn�t swayed by assurances that the DA could provide the legal advice and representation he required, and at no extra cost to taxpayers. �I prefer to have the position that I put in the budget,� he said. Wilder knows the reorganization, coming on the heels of Hinojosa�s failed rebellion, looks like retaliation. But he insists he�s simply a manager streamlining an office that he has overseen for a dozen years and knows inside and out. Hogwash, said Hinojosa. �Wilder will repeat a lie or half-truth long enough until people believe him,� he said. It�s up to county commissioners to determine whether Wilder is playing political games and whether Hinojosa, Cook, and Hernandez keep their jobs. Budget discussions begin in a few weeks and should provide plenty of intense public debate about Wilder�s plan.